Positioned on the southernmost point of the eight-hundred-mile-long Baja Peninsula, the vacation paradise of Cabo San Lucas has been a seaside resort destination for over five decades. 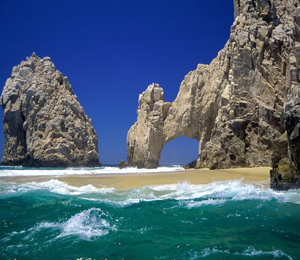 Cabo rests on the coastline of a picturesque harbor near the junction of two immense bodies of water, the Pacific Ocean and the Sea of Cortez (also called the Gulf of California). The unfathomable currents of the Pacific merge with the temperate protected waters of the Sea of Cortez just off the granite peninsula named Land's End, only a few minutes from Cabo San Lucas Marina by water. Once a charming coastal hamlet, Cabo San Lucas, in addition to the luxury stretch of coastal resorts called the Golden Corridor and the traditional Spanish-colonial city named San Jose del Cabo, draws travelling vacationers from North America as well as all over the planet. An array of first-class resorts, miles of sugary-white beaches, elite golf courses, gourmet cuisine, boisterous nightspots, and a state-of-the-art downtown marina coalesce to ensure that the area of Los Cabos an idyllic vacation haven. You will discover some of the best Deep Sea Fishing on the globe only minutes from the docks of the marina in downtown Cabo San Lucas. A bountiful assortment of game-fish inhabits the gorgeous waters off the southern Baja Peninsula. Angling devotees will enjoy plenty of fishing opportunities; depending on the time of year and the weather, you will have your shot at landing a range of billfish, including Blue Marlin, Swordfish, Striped Marlin, Sailfish, and Black Marlin. Cabo San Lucas is often referred to by professional tournament anglers as the Striped Marlin Capital of the World. Other species prevalent in the nearby waters include Dorado (Mahi Mahi), Wahoo, Yellowfin Tuna, Yellowtail Tuna, Bluefin Tuna, Bonita, Bigeye Tuna, and varieties of Mackerel, Snapper, Grouper, Jacks, Sharks, and Rooster Fish, among others. If you love water sports, Cabo San Lucas is the ideal vacation locale for you. In the spectacular waters off the Baja Peninsula you can enjoy Snorkeling, Surfing, Scuba Diving, Snuba, Parasailing, Whale Watching, Kayaking, Sailing, Sunset Cruising, Booze Cruising, Glass Bottom Boat Touring, and Jet Skiing. If you enjoy land based excursions - the pristine desert back country of Baja provides the ideal setting for motorized thrills on ATVs or less ecologically-intrusive tours like hiking or horseback riding. The picturesque Baja desert environment is a truly awe-inspiring setting. The collective region, named Los Cabos, includes the lively city of Cabo San Lucas, the 20-mile tract of seaside resorts dubbed the Golden Corridor, and the old-world hamlet of San Jose del Cabo. Compared to the rowdy fiesta-like atmosphere of Cabo San Lucas, San Jose del Cabo allows visitors to unwind in a mellower setting where they can immerse themselves in local Mexican culture, including timeless architecture, authentic native cuisine, and local stores featuring masterfully-crafted keepsakes. But, most people who travel to Los Cabos, like the hoards of college students who migrate to Los Cabos every March for spring break, come for the rollicking fiesta that occurs all day and through the night at cantinas like Mambo Café, Cabo Wabo, and Squid Roe.